It was a rough night for the Phoenix Suns on Tuesday, but the performances from their big men helped provide a bright spot in the loss to the Nets. Deandre Ayton continued his dominant play in the paint as he notched yet another double-double with 15 points and 13 rebounds. The rookie’s six double-doubles this year are the most by a Suns player in the first 10 games of a season since Steve Nash had six in 2009-10. Even when Ayton wasn’t on the court, the Suns still received production from the center position. Richaun Holmes has been a spark of energy off the bench this season and Tuesday was no different. Holmes battled his way to his seventh-career double-double and first as a Sun as he finished with 13 points and 10 rebounds while shooting 85 percent from the field. Head Coach Igor Kokoškov gave credit to what Holmes provides in the team’s second unit. The 25-year-old center embraces his role and looks to continue to take advantage of his time on the court. After winning the previous game in the final seconds, the Suns weren’t able to pull off back-to-back victories as they fell to the Nets 104-82. Booker said following the game that the key going forward is to hold each other accountable on the court. 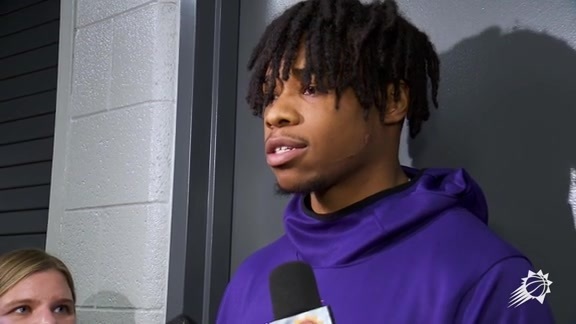 “I think all good teams have that trust and chemistry where everybody can get on each other and know that it’s for a better purpose,” Booker said. The Suns will wrap up their five-game homestand on Thursday when the Boston Celtics come to town. Be sure to catch the action on Fox Sports Arizona.